This B&H Kit combines the Synology DiskStation DS1618+ 6-Bay NAS Enclosure with six WD 8TB Red 5400 rpm SATA III 3.5" Internal NAS HDDs for a total storage capacity of 48TB. Built with a quad-core processor, an AES-NI hardware encryption engine, Btrfs file system support, and 1080p video transcoding, the DiskStation DS1618+ 6-Bay NAS Enclosure from Synology is a high-performance system designed for tackling multitasking challenges and provides storage scalability for tech enthusiasts and small- to medium-sized businesses by handling workloads. Further boost storage performance with the by installing a dual M.2 SATA SSD card for high-IOPS system caching or enhance network speeds by adding a 10GbE NIC. This NAS is equipped with six drive bays that are capable of natively supporting 3.5" SATA hard drives, as well as 2.5" SATA hard drives and SSDs for data storage, plus two M.2 2242/2260/2280 SSD slots for caching. Using its six drive bays, this NAS will allow you to store and share many files, including videos, music, photos, and documents with up to 2048 user accounts and 1000 maximum concurrent connections. The DS1618+ runs on the Synology DiskStation Manager (DSM) OS, which is a browser-based operating system which helps to simplify managing your Synology NAS. Its CPU is a 2.1 GHz Intel Atom C3538 Quad-Core and its 4GB of DDR4 RAM, which be upgraded to 32GB, allows frequently-used files and applications to be quickly accessed. The NAS is capable of achieving sequential read speeds of up to 2037 MB/s, while a dedicated hardware transcoding engine can transcode 1080p / 30 fps video via Video Station. Also featured are three USB 3.0 Type-A ports and two eSATA port which allow it to be connected to your Windows or Mac system, and network connectivity is achieved via the four Gigabit Ethernet ports that support Link Aggregation and Failover, allowing your stored data to be shared with users throughout the network. For those who require RAID support, the DS1618+ supports RAID 0, 1, 5, 6, and 10, as well Synology Hybrid RAID and Basic RAID, each of which offers performance, data redundancy, or a combination of both. For those who do not require a RAID, JBOD is also available, allowing each drive bay to be individually utilized. The DS1618+ is engineered to be energy efficient. Not only does it offer two 92 x 92mm fans to help keep the system running cool always, its noise dampening design of 23.7 dB(A) makes for quiet operations. The server supports numerous scheduled power on / off cycles and hard drive hibernation to further minimize power consumption and operation expenses. The Synology DiskStation DS1618+ 6-Bay NAS Enclosure operates on 100-240 VAC at 50/60 Hz and includes an accessory pack, a power cord, and two RJ45 LAN cables. If you need to expand its storage, the DS918+ can be connected to two DX517 expansion unit. Protection is provided by a limited 3-year hardware warranty. The DS1618+ is a 6-bay NAS that provides storage scalability for tech enthusiasts and small- to medium-sized businesses by handling intensive workloads. Further boost storage performance with the optional M.2 SSD cache or enhance network speeds by adding a 10GbE NIC. The DS1618+ comes with a PCIe expansion slot to support add-in cards. Install the M2D17, a dual M.2 SSD card that supports 2242, 2260, and 2280 form factors high-IOPS system caching, or a 10GbE NIC for fast data transmission in bandwidth-intensive environments. File Station is a web-based, fast, and secure management tool built to allow user-friendly, drag-and-drop operations without requiring complex setups on Mac or Windows. Advanced search and filtering tools allow for the organization and sharing of files with just a link. SMB, FTP, AFP, NFS, and WebDAV are supported and compatible with most environments. Office is a collaboration package combining the convenience and usability of public clouds with the data privacy and security offered by private clouds. It allows you to work seamlessly together on documents and spreadsheets in a protected environment. The DS1618+ integrates various backup applications to help safeguard your important data on most devices with an intuitive user interface and durable storage technologies. 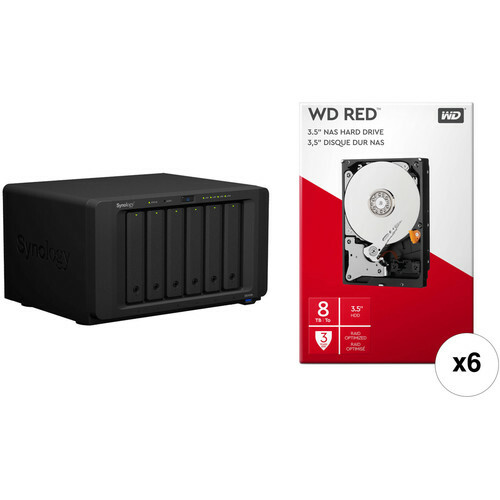 Designed with home and small office/business customers in mind, the 8TB Red 5400 rpm SATA III 3.5" Internal NAS HDD Retail Kit from WD is well-suited for NAS environments with up to eight 3.5" drive bays. Engineered to handle increased workloads, this 8TB drive operates using a SATA III 6 Gb/s interface, a 256MB cache, and a rotational speed of 5400 rpm, all of which help to ensure uninterrupted data transfers with a sustained rate of up to 178 MB/s. This drive also features high levels of reliability, with 600,000 load/unload cycles, <10 in 1014 non-recoverable read errors per bits read, error recovery controls, and 1,000,000 hours MTBF for 1-8 bay NAS systems. Also built into this drive are noise and vibration protection and WD's NASware 3.0 helps increase system compatibility, allowing WD Red drives to be more easily integrated with your existing network infrastructure. Box Dimensions (LxWxH) 16.0 x 13.0 x 12.0"
Box Dimensions (LxWxH) 7.5 x 5.0 x 2.6"